Phonetime Online is the ultimate in internet promotions! 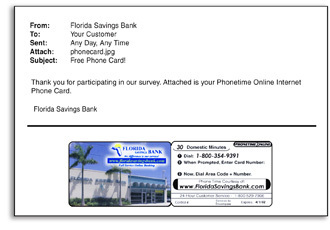 Your company can give away prepaid phone cards to web visitors directly from your website. It's an effective way to build traffic, capture market data or reward customer loyalty. best possible internet phone rates and avaialability.